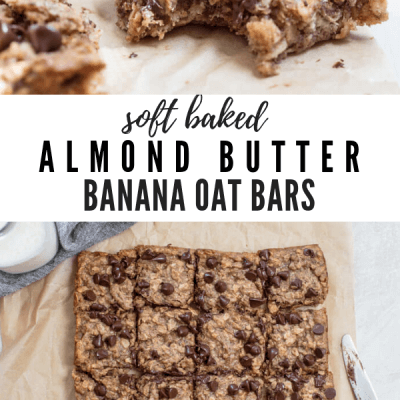 Soft Baked Almond Butter Banana Oat Bars, a whole food bar made in one bowl with simple ingredients. Soft baked and yummy for breakfast, snack or dessert. 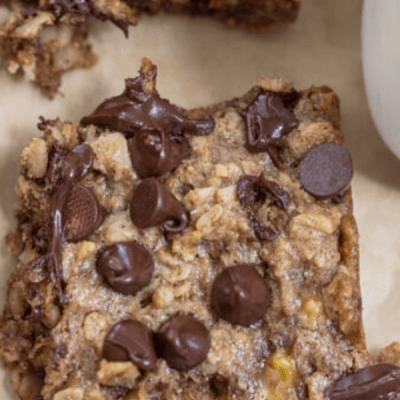 Soft Baked Almond Butter Banana Oat Bars… sorry not sorry friends. 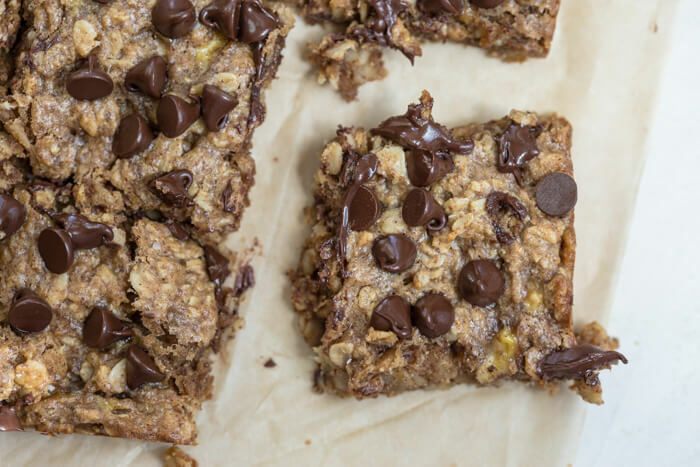 Gooey, chewy, soft, crumbly, chocolatey and lots of banana flavor. 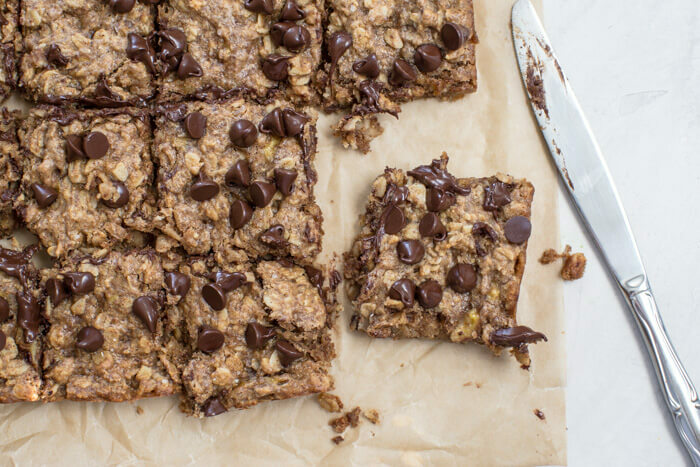 These Soft Baked Almond Butter Banana Oat Bars are W.O.W and so good! Can a recipe be too good? After I made this recipe I’m thinking maybe that’s a possibility. Like this is the second batch I made this week and I think I’m going to be sharing with the neighbors… because ya know. Oh and can I tell you they are sooo easy– all whole food ingredients, mixed into one bowl, and bake. That’s it people. And the good news is you probably have all of these ingredients in your pantry. 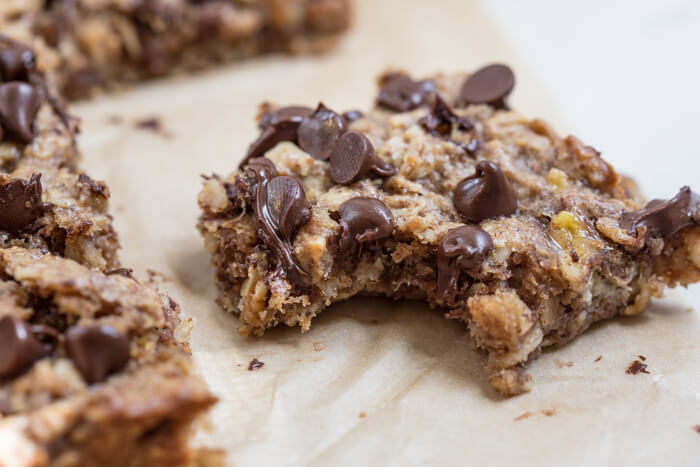 These bars are based off of my ever popular Soft Baked Oatmeal Chocolate Chip Bars. 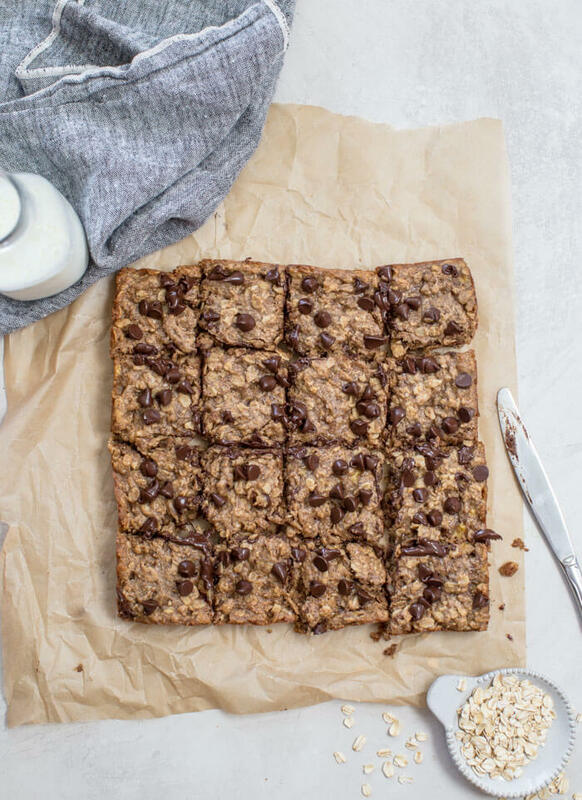 And you don’t want to miss this kid (and baby) friendly soft baked almond butter banana oat bars version. 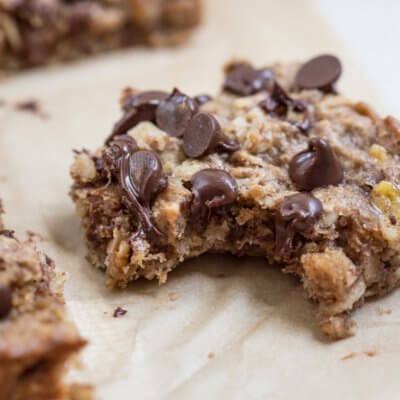 This recipe is egg free and dairy free vegan if you opt for vegan chocolate chips. Can you see all of that melty chocolate and banana goodness on that piece? OHMYGEE. That’s what I’m talking about too good. 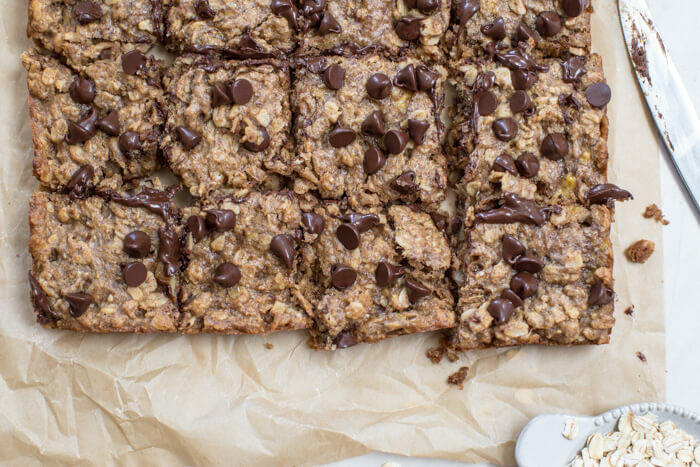 oh and chocolate chips… if you are like me and love chocolate. But if you are making these for littles, especially babies, leave out the chocolate–errr maybe only add them to your half. 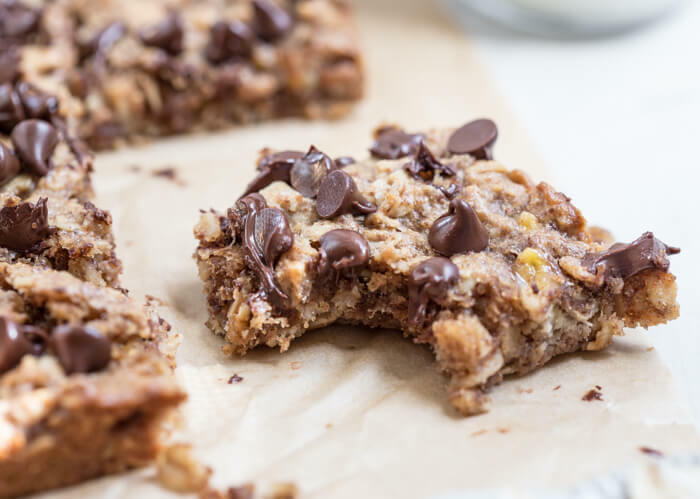 I’m telling you these Soft Baked Almond Butter Banana Oat Bars are pretty AHHHMAZING and a must bake this weekend. Pro tip: put these bad boys in the fridge if you want them to be a little more firm for little hands. I think they taste good on the counter top or in the fridge or even warmed up for 5 seconds in the microwave with a cold glass of milk… or coffee whatever you’re craving. Oh and I know they are hard to resist when they are straight out of the oven but please let them cool before cutting or you will have a gooey mess. These bars are SOFT baked so they do need a bit of time to firm up by cooling down on the counter top, at least 30 minutes before slicing into. I know, I know… but I promise it’s worth the wait. 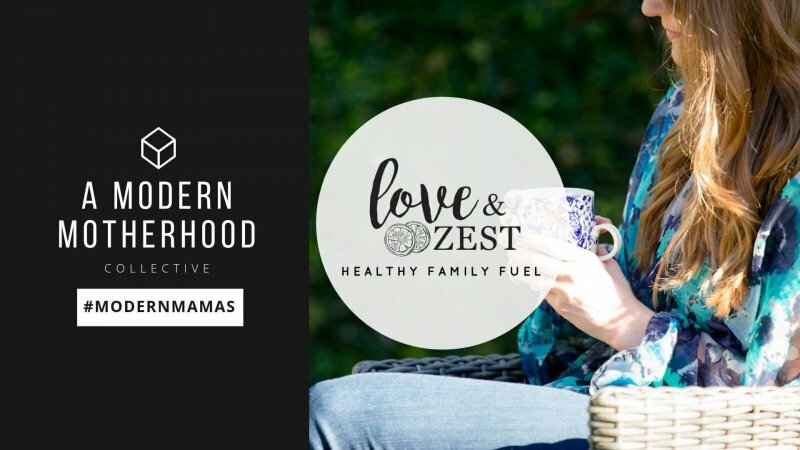 As always, if you make this recipe please leave a review below and take a pic and tag me on Instagram @loveandzest or #loveandzest to tell me what you think! In large bowl, mix together coconut oil, almond butter, flaxseed, banana, and maple syrup. Stir in baking powder, salt, and oats. Bake for 25 minutes and allow to cool for 45 minutes before slicing. Slice into 16 bars. Can you sub peanut butter for almond butter for tree nut allergy? 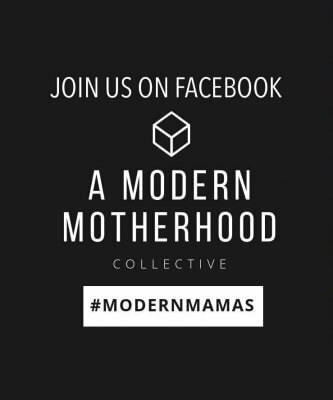 We make something similar and my daughter loves them. So easy to adapt too. 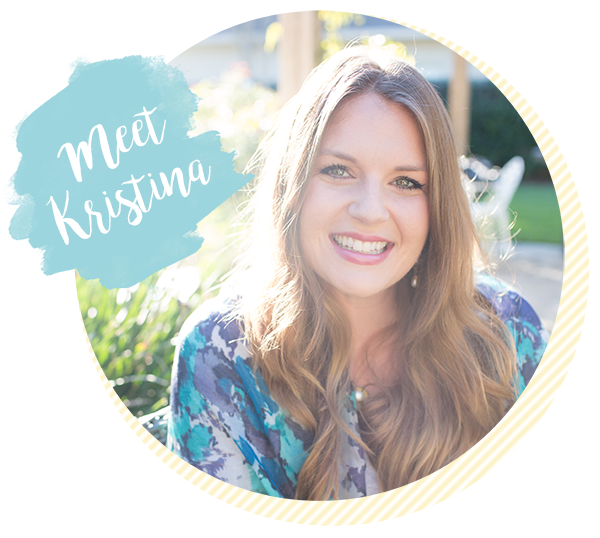 Oh yum Kristina!! The photos are delicious, I am not sure I would be able to wait the required cool off time though as I would want to eat them straight from the oven. Those chocolate bits are making me wish I had a piece to try right now! Now they sound properly lovely, fab sweet sticky treats! 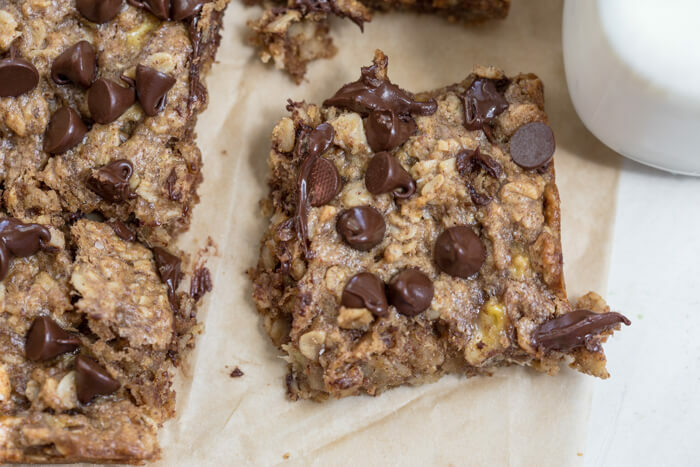 These bars look so delicious and healthy! Such a great snack! Almond Butter and Bananas always work perfectly together! These bars look so chewy and good!